Kansas motorists will soon be able to legally drive 75 mph on designated parts of divided four-lane highways. 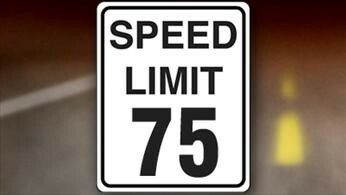 Governor Sam Brownback has signed legislation raising the state’s maximum speed limit from the current 70 mph. The change takes effect July 1 and lets the transportation secretary decide where to post the higher limits. The Kansas Department of Transportation estimates nearly 1,100 miles of highway, mostly interstates, qualify for the higher speed limit. Legislative proponents argued the change would help dissuade because freight companies from bypassing Kansas in favor of states with higher speed limits. Others pointed out that Kansas motorists routinely exceed the 70 mph limit anyway. Opponents countered that if the posted speed limit is 75, drivers will now go 80 or 85, putting themselves and others at more risk.